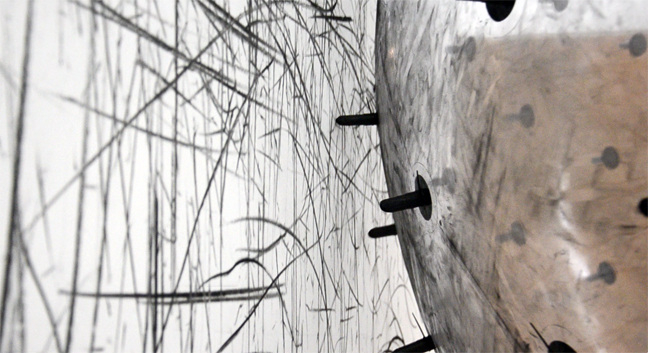 Similar to Tinguely’s «Méta-Matics», is ADA an artwork with a soul. It acts itself. At Tinguely’s it is sufficient to be an unwearily struggling mechanical being. He took it wryly: the machine produces nothing but its industrial self-destruction. 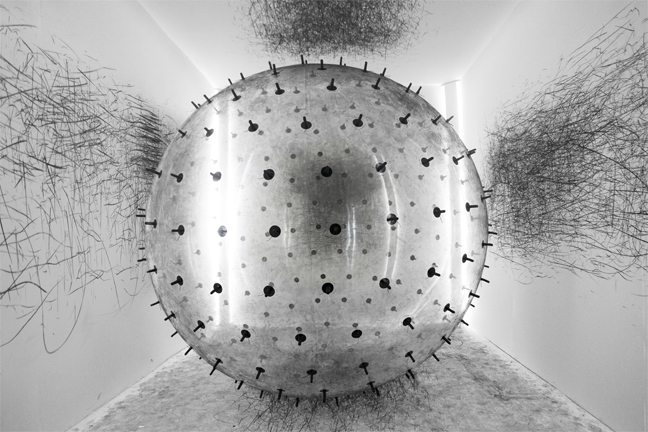 Whereas ADA by Karina Smigla-Bobinski, is a post-industrial “creature“, visitor animated, creatively acting artist-sculpture, self-forming artwork, resembling a molecular hybrid, such as a one from nano biotechnology. It develops the same rotating silicon-carbon-hybrids, midget tools, miniature machines able to generate simple structures. 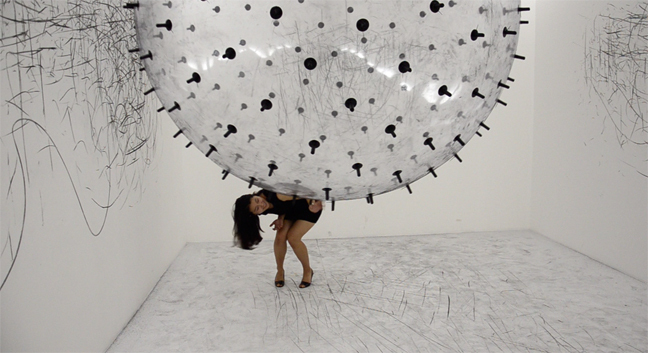 ADA is much larger, esthetically much complexer, an interactive art-making machine. Filled up with helium, floating freely in room, a transparent, membrane-like globe, spiked with charcoals that leave marks on the walls, ceilings and floors. Marks which ADA produces quite autonomously, a though moved by a visitor. The globe obtains aura of liveliness and its black coal traces, the appearance of being a drawing. The globe put in action, fabricate a composition of lines and points, which remains incalculable in their intensity, expression, form however hard the visitor tries to control ADA, to drive her, to domesticate her. Whatever he tries out, he would notice very soon, that ADA is an independent performer, studding the original white walls with drawings and signs. More and more complicated fabric structure arise. It is a movement experienced visually, which like a computer make an unforeseeable output after entering a command. Not in vain ADA reminds of Ada Lovelace, who in 19th century together with Charles Babbage developed the very first prototype of a computer. Babbage provided the preliminary computing machine, Lovelace the first software. A symbiosis of mathematics with the romantic legacy of her father Lord Byron emerged there. Ada Lovelace intended to create a machine that would be able to create works of art, such as poetry, music, or pictures, like an artist does. 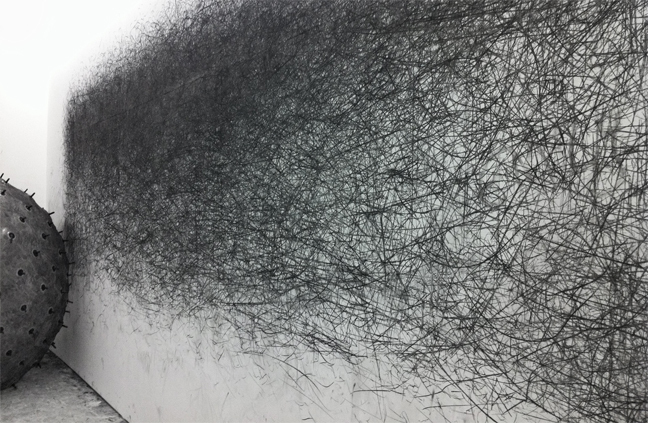 ADA by Karina Smigla-Bobinski stands in this very tradition, as well as in the one of Vannevar Bush, who build a Memex Maschine (Memory Index) in 1930 (“We wanted the Memex to behave like the intricate web of trails carried by the cells of the brain”), or the Jacquard’s loom, that in order to weave flowers and leaves needed a punch card; or the “analytic machine” of Babbage which extracted algorithmic patterns. ADA up rose in nowadays spirit of biotechnology. She is a vital performance-machine, and her patterns of lines and points, get more and more complex as the number of the audience playing-in increases. Leaving traces which neither the artist nor visitors are able to decipher, not to mention ADA herself either. And still, ADA’s work is unmistakable potentially humane, because the only available decoding method for these signs and drawings , is the association which our brain corresponds at the most when it sleeps: the truculent jazziness of our dreams.